It’s always nice to receive a gift, even more so when it arrives unexpectedly. This recipe came on the side of the paper bag that held my takeaway from the Aagrah in Shipley. It’s a nice little gimmick, and a welcome one given that the Aagrah stands head and shoulders above all other Indian restaurants in Bradford and Shipley. Their food is simply excellent, so having one of their recipes fall into my hands is a bit like a mini Christmas for me. As with all Indian cooking, the list of ingredients is about a mile long, but the method isn’t complicated and the dish comes together quite quickly. Start by grinding some spices in a blender – the seeds from two black cardamom pods, a medium cinnamon stick, five cloves, a dessert spoon of coriander seeds, half a dessert spoon each of cumin seeds and black cumin seeds, a dessert spoon of poppy seeds, six black peppercorns, half a dessert spoon of fenugreek leaves (a small handful, really) and three bay leaves. Set the spices to one side and fry two chopped onions in oil until they’re about half cooked, just starting to go translucent, and then add four dessert spoons of pureed garlic and two dessert spoons of pureed ginger. I used about a dozen garlic cloves and a thumb sized piece of ginger, both peeled and blitzed in a blender with some water to make a smooth paste. Stir the garlic and ginger into the onions and continue to cook over a medium heat for a few minutes. Add five tomatoes, chopped into quarters, six dessert spoons of plain yoghurt and five of double cream. A touch more won’t hurt. Carry on cooking for about ten minutes, stirring occasionally, before lowering the heat and adding the ground spices. Cook for another five minutes. The sauce should be thickening nicely by this stage, and will smell astonishingly good. Next, give it a kick…add three quarters of a dessert spoon of turmeric and a good teaspoon or more of red chilli. Go as hot as you like here. Season with a dessert spoon of salt and allow to cook very slowly and gently for fifteen minutes. Next, add a kilo of boneless chicken, cut into pieces a couple of centimetres across. I used a whole 1.7kg chicken, skinned it and cut the meat away from the bones – cheaper than buying pre-boned meat and with the added advantage of a spare carcass for stock making. The chicken shouldn’t take long to cook. Maybe ten or fifteen minutes of gentle bubbling. To finish, add a splash of Kewra water and a small handful of chopped coriander. If you want, garnish it with a few sliced green chillis. The finished dish is rich, very rich, but spicey and flavoursome. It’s got a healthy heat to it and is best served with something plain, maybe some boiled rice. The curry itself should be the star of the show. Great photo!!! Looks so good! Thanks for sharing. Beautiful! I love the spices in this recipe and the photograph is incredible! I love curry. The aroma of the different spices combined is absolutely amazing. Your picture shows how wonderful the flavor is. great photo! I love curry–curry is an experience, isn't it? 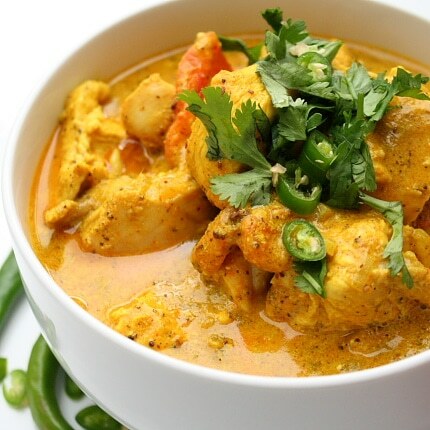 Now I'm craving curry! Beautiful picture! Indeed – great photo. And yes, what a bonus it is when you find those recipes; the only gripe being that they've been giving out the same one for quite a few years now! I tried this with some of Binns the Butchers wonderful diced lamb shoulder and that too was marvellous. There are at least two recipes in circulation, but they do have a book to sell, so I can understand why they don't give away more. Yes, fair point. I might have to get the book. I take it you don't have it? Our curry bible is Camellia Panjabi's 50 Great Curries of India but I have to say that none of the recipes from there have turned out quite as well as the Hyderabadi recipe above. Wow…this bowl of curry looks amazing, LOL..Yes the list of ingredients are always a mile long, but it is so worthed, right? It looks beautiful. I need to eat this! I have a Gosht Achar paper-bag recipe from the Aagrah. I tend to swap the lamb for chicken, but either way it's simple and delicious – will definitely have to give this one a go! Thank you for this recipe and for your beautiful blog, we love curry and we will certainly try this one! I do adore Indian food, it is so intense and fragrant. Love it. Very nice. The ingrediant list really isn't that long, spices are pretty easy to deal with. It there were 30 other things in it, then we'd be talking. Love curries, and I love the sound of this – almost sounds better than your Rogan Josh (which I loved) I _have_ to try this! what a absolute delightful presentatin of a beautiful yummy dish. akes me hungry to see this always. great blog! My compadre and I just made this chicken. It is AWESOME!!!! (pardon the caps). Our spin on it…I added some habanero peppers since he loves very spicy food. My experience is that food that is very aesthetically pleasing, doesn't quite match-up tastewise. This chicken did.And then some. Thanks Rich! I will be looking through your other recipes. You passed the entrance exam!!!! Rich how many people does this recipe serve ? Four, with lots of rice, naans, chapatis, etc, etc. Should the Food Standards Agency be scrapped?